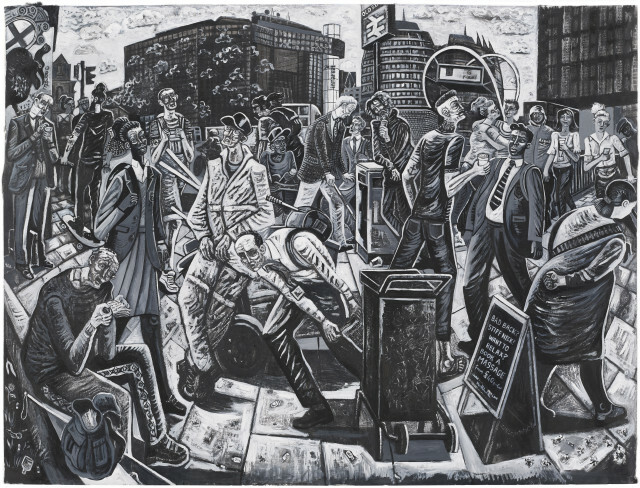 Ed Gray seeks out the spectacular in the ordinary with his sketchbook to create layered panoramas infused with London mythology and the grit of the urban experience. Inspired by his love of Renaissance Adoration scenes from the Sainsbury Wing of the National Gallery these are celebratory hymns to the flow of the passing city. Gray's paintings celebrate the multiplicity of life and the unknowable lives lived within this shifting monochromatic modern metropolis. "My paintings begin life as quick street sketches. I spend a few days in a particular chosen place, usually an intersection of some kind or a place of memory for me. I share stories with people I find there sometimes and I draw as much as I can, mostly without looking down at what I am drawing. Working from these sketches and from memory I try to recreate the spirit of the scene back in the studio over time. Songs and stories, past and current events become entangled in the developing narrative composition as I work. 'The Passing Show', the title for this exhibition, comes from a song about mortality written by the late great singer songwriter and painter Ian Dury. It is this 'passing show' of life that I try to capture in pencil, ink, chalk, charcoal and paint. The beauty of Ian's poetry sums up so much of what I felt whilst making my recent work. At the heart of these new paintings is a feeling of a city on hold in uncertain times. Central chacters observe the passing show from static positions. Peoples' faces are etched with frowns as they plough on "unsteadily", ''guarded and abrupt' to wherever this passing show will lead us next. The Passing Show is the passing of an older city evolving into a newer city through the daily cycle of decay and renewal. The Passing Show is also a kind of travelling circus and the title represents the idea of the show moving from St Martin-in-the-Fields to GX Gallery... coming home. Lastly 'the passing show' is the creative act that you lose yourself in when you make a painting; the forgotten moments that you don't see beneath the paint and the wrong turns that reveal the right turns...the ones that got away. These paintings created from the wealth of humanity that fills my sketchbooks are my act of adoration for all that this city has given me".